Washington (6-0), idle this past week, remained at No. 5 in the Associated Press and Coaches polls, both released Sunday. The Huskies host Oregon State next Saturday. Idle Saturday, Washington (6-0) remained No. 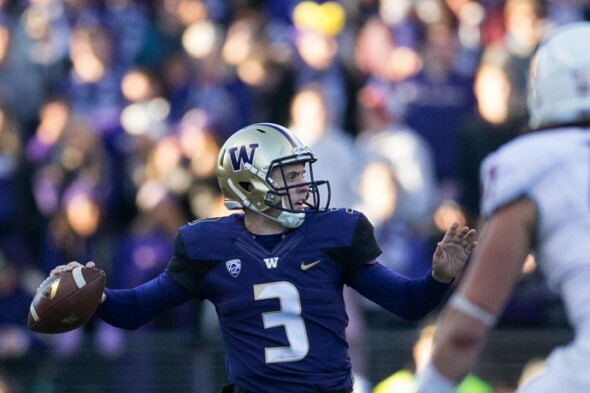 5 in the weekly Associated Press college football rankings released Sunday as three of the four teams ahead of the Huskies — No. 1 Alabama, No. 2 Ohio State and No. 4 Clemson — all scored wins while No. 3 Michigan was idle. Ohio State and Clemson both needed overtime to stay in the top four. Washington received 1,304 points and trail the Crimson Tide (1,524), Buckeyes (1,457), Wolverines (1,368) and Tigers (1,337). Undefeated Texas A&M (6-0) stayed at No. 6 and Louisville at No. 7. UW also retained the No. 5 ranking in the coaches poll. This is UW’s highest national ranking since the 2000 team finished that season No. 3. Utah (6-1), which defeated Oregon State 19-14 Saturday, moved from No. 21 to 19th this week. No other Pac-12 school cracked the Top 25, although Colorado (110), Washington State (39) and Stanford (15) received votes. The Buffaloes clobbered Arizona State 40-16; the Cougars edged UCLA 27-21, and Stanford toppled Notre Dame 17-10. The Huskies, coming off a 70-21 win at Oregon, will host Oregon State Saturday at 3:30 p.m. The game will be televised by the Pac-12 Networks. Clemson looked weak and the QB for OSU didn’t look as good as his press. He is an excellent runner but a very average passer. Both these teams will lose this year.